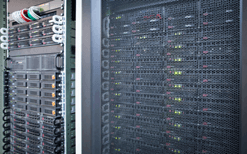 Prahost dedicated servers are fully customizable for bandwidth, port speeds, memory, and HDD. Standard Netherlands servers come with 100mbps port and best effort SLA. Our Netherlands dedicated servers are located in EvoSwitch data center in Amsterdam region. It is one of the leading high standard network neutral data center. All our servers are framed on a speedy 10 TB bandwidth providing groundbreaking speed throughout Europe, Asia and America. Following dedicated servers are fully customizable for bandwidth, port speeds, memory and HDD. Standard netherlands servers come with 100mbps port and best effort SLA. PraHost offers its dedicated servers in netherlands with a range of reliable and fast processors along with a choice of 4GB to 256GB RAM and bandwidth ranging from Unmetered, 10TB and 100TB with 100Mbps, 1Gbps and 10Gbps port. We have an assortment of processors starting from latest Intel Dual Core, Intel Quad Core Xeon E3 , E5 to Dual Intel Xeon E7. Our Netherlands Servers plans start at just EUR 39.00 per month. Why Select Netherlands Dedicated Server Hosting? PraHost's network is connected to the largest carriers and traffic exchange points, which guarantees the availability of resources. Our dedicated servers are powered by high performance Intel Xeon processors which come with an abundance of raw power. Our Altruistic Support are there to assist you 24 x 7 x 365 days of the year. They never takes a holiday and never gives up on helping clients. PraHost Netherlands servers uses Amsterdam Internet Exchange (AM-IX) which is one of the largest traffic junctions of the world. Our dedicated servers are hosted one of the the secure data centers in Germany and Netherlands, guaranteeing the safety and privacy. PraHost is a registered hosting company from India, founded in 2008. PraHost works fully independently and requires no financial institution's back up. Still confused about our services? Read PraHost review by our existing clients. It has been great experience with you PraHost. I have been using your hosting services since you started your company in 2008 with shared hosting and overall it has been a great experience. Your customer support, packages and affordable pricing structure is just great for startups like me. Hope you continue to be great in future. Thanks for all the support and suggestions you have given me. You will be delighted to know that we are migrating off from one of your competitors to avail your flawless services. I have been referred PraHost name by one of my friends already using your services. At first, I was reluctant to migrate, However, the decision I made to use your services has benefitted me a lot in experiencing trouble with other netherlands server provider. Surely, I will recommend your name to my other friends and colleagues. Customer support was paramount necessity when we decided to move our hosting needs with PraHost.It is very much fulfilling to witness the technical support you have provided us according to our expectations. Surely, you along with your support team have helped us improve our online reputation. We will use your services for our upcoming online commerce store. I am managing almost few websites for me and for my colleagues all using dedicated servers from PraHost. The features, services and flexibility I received from you are simply unmatched with other hosting providers. I will always recommend you for the accountability, speed, convenience, flexibility and support you have provided in managing these websites. We have found a reliable and companion partner in PraHost for all our hosting solutions. A club that is well accessible, attends and does what they say. All in all, a nice partner to work with. Sta******us.com, as a small webmaster, needs big support from a hosting company. Where other hosting companies excel in low prices for large-scale, low-service accounts, PraHost has a high-quality service at a competitive price, more than proven. There has been cooperation over a period of 5 years, a solid partnership that allows Sta******us.com projects to prove themselves on the Internet. As companies grow larger, they often cost at the expense of personal contact and accessibility. A positive exception is PraHost, Always reachable by support desk without waiting time and also outside of office hours, issues are resolved quickly. More than 6 years ago, we first introduced PraHost. Started with shared hosting, then its own powerful server and again a more powerful and faster server. Good communication, sufficient knowledge and reliable systems make PraHost a party that made the above changes silent, so work well together. As far as we are concerned, we are ready for the next 6 years! I think the helpdesk provides great service. You get a quick response to your question and you are generally very friendly. You notice that it is the employees who are looking forward to it. Occasionally, I find that trainees are adopted and that they lack insufficient knowledge and sometimes give false opinions. This is a point of attention. PraHost has been the permanent hosting party of CSK for several years. During that time, PraHost has proven itself as a reliable partner. Any questions are always answered very quickly. So far, we have never experienced a downtime and the speed of our server is excellent. We have been doing business with PraHohst for more than 2.5 years and are very pleased with their offered netherlands server. PraHost offers good value for money, has sufficient technical knowledge and responds quickly to support requests. Deshp and PraHost have been working together for a long time. PraHost has proven itself in the past few years as a reliable hosting partner with the necessary knowledge and experience. Our Netherlands Servers display surpassed performance, scalability, site functioning, speed, and tag the guarantee of our Altruistic Support and 99.98% Server Uptime. Perfect for uninterrupted business activities. 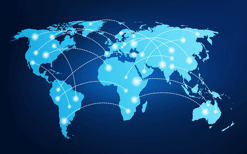 we are positioned to provide service to clients all over the world.